Frame duplication is a common way of digital video forgeries. State-of-the-art approaches of duplication detection usually suffer from heavy computational load. 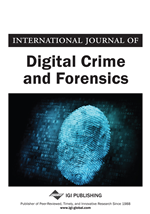 In this paper, the authors propose a new algorithm to detect duplicated frames based on video sub-sequence fingerprints. The fingerprints employed are extracted from the DCT coefficients of the temporally informative representative images (TIRIs) of the sub-sequences. Compared with other similar algorithms, this study focuses on improving fingerprints representing video sub-sequences and introducing a simple metric for the matching of video sub-sequences. Experimental results show that the proposed algorithm overall outperforms three related duplication forgery detection algorithms in terms of computational efficiency, detection accuracy and robustness against common video operations like compression and brightness change. Wang et al. (2007b) proposed a frame duplication detection algorithm. The video is first divided into overlapping sub-sequences, with only one different frame between adjacent sub-sequences. For each sub-sequence, they computed the correlation coefficient between each pair of frames, composing a correlation coefficient matrix that carries the temporal information of this sub-sequence. To judge whether two sub-sequences are duplicated, the correlation coefficient between the matrixes of these two sub-sequences are calculated and compared with a threshold. If the coefficient exceeds the threshold, the two sub-sequences may be duplicated. To confirm the duplication, spatial information is used for further detection. Specifically, they divided the two frames into non-overlapping blocks and calculated the correlation coefficient between each pair of blocks in corresponding positions. They recorded the number of block pairs having large correlation coefficients. If the number exceeds a predefined threshold, they considered the two frames were duplicates of each other, which indicated that the video had undergone duplication forgery. However, the calculation of correlation coefficient is known to be time consuming; and moreover, the correlation coefficient was employed twice to represent the temporal and spatial information, respectively. As a result, their algorithm requires a heavy computation load.